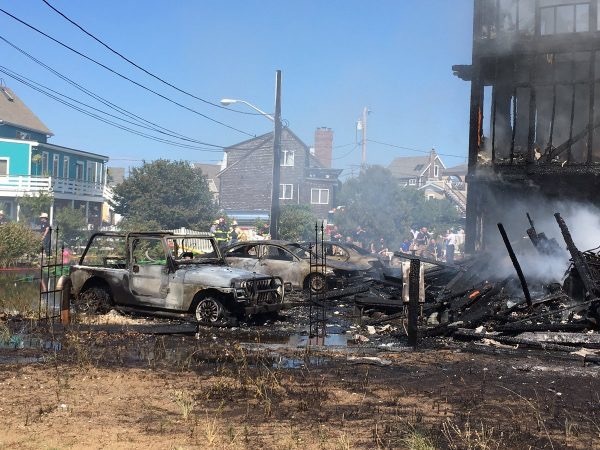 The Newbury Fire Department battled a five-alarm fire on Plum Island this afternoon. NEWBURY — Fire Chief Nathan Walker reports that the Newbury Fire Department fought a five-alarm fire today on Plum Island. Shortly before 1 p.m., the Newbury Fire Department received a report of a first-floor fire at 11 20th St. on Plum Island. A Newbury Fire Captain who lives nearby saw flames and alerted the fire department immediately. Upon arrival, firefighters were met with heavy smoke and flames at a three-story wood frame home. 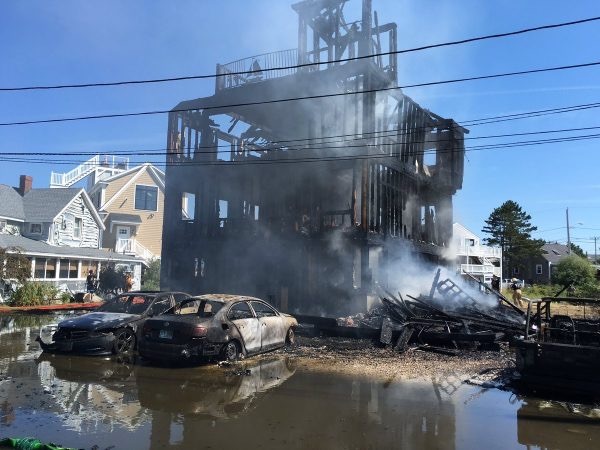 A five-alarm response was ordered to increase manpower and the fire was docked down around 3 p.m. Fire departments from Newburyport, Groveland, Georgetown, West Newbury, Ipswich, Amesbury, Merrimac, Haverhill and Hampton N.H. responded to the scene. Middleton, Essex, Ipswich, Exeter, N.H. and Hampton, N.H. fire departments provided station coverage. The home was destroyed by the fire, along with several vehicles in the vicinity. Two other adjacent buildings sustained heat damage, but were spared from major damage due to quick firefighting efforts. Firefighters will likely remain on scene throughout the evening. No one was inside the home when the fire started and no one was injured. Several firefighters are being evaluated for heat exhaustion and one firefighter was transported to an area hospital for heat exhaustion. The origin and cause of the fire remain under investigation by the Newbury FIre Department and the Massachusetts State Police assigned to the Office of the State Fire Marshal.